Microbiome research is one of the hottest scientific topics in the past two years. It is a very broad and multidisciplinary research area, which has application in areas from agriculture to zoology. 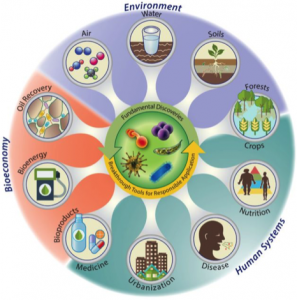 The White House Office of Science and Technology recently announced a new ‘National Microbiome Initiative” (NMI) with the goal of supporting interdisciplinary research. The Center for Protease Research and the Cellular & Molecular Biology interdisciplinary graduate program (CMB) will host a yearlong seminar series on “Microbiome” with the intent of introducing the concept and assessing the capacity for establishing a “Center for Microbiome Studies” at NDSU. The goal for the seminar series is to provide a ‘scientific forum’ where NDSU faculty and students from a variety of disciplines can interact and discuss potential collaborations. Some details on the seminar series are provided below. Faculty and students who are interested in making presentations and departments that would like to suggest outside speakers please contact Mukund Sibi (Mukund.Sibi@ndsu.edu), Jane Schuch (Jane.Schuh@ndsu.edu), or Charlene de Celle (charlene.decelle@ndsu.edu).